I also added squiggly lines on my chart, just to add to the general confusion on it. The Yellow Line is the Volume Weighted Average Price (VWAP), and the other lines are the 1st, 2nd, and 3rd Standard Deviations (1SD, 2SD, 3SD) of the Price from VWAP. Since it was discretionary, I just decided to make commentary notes about my trading, since unlike mechanical trading, the rules and logic can be shared. 9:20☄ Opened slightly higher, well within yesterday's range. Slow slide down. Nothing to do. 9:55☄ Tested 7800. Insignificant volume. Ignored. Bounced well from there, and went to Day Open. 10:35☄ Reversed from Day Open. Had good volume when it breached 7800 Spot (10:48 Candle). Signal to get ready for action. 10:57☄ Waited for 7800. Hoped for a double bottom. On touch on 7800, placed long trigger at high of 10:45 candle. That did not trigger. 11:05☄ Broke 7800, but also broke Day's Low (LOD) and Yesterday's Low. Not the Double Bottom that I had hoped for. So, decided to wait for Pullback (PB) to 1SD to short. That too did not happen. 11:12☄ Entered Breakout Pullback (BPB) short at 7787. Price stalled immediately after my entry. That's so irritating, mentally. Doesn't allow me to feel like a person who knows what he is doing. IRRITATING. 11:35☄ Touch of 1SD happened (should have here waited for first entry? ), and price stalled. 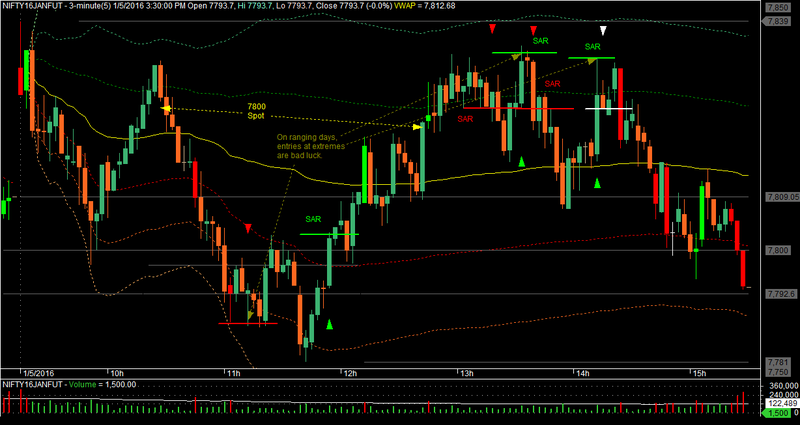 I placed a (Stop and Reverse) SAR order above the 1SD pivot. Then price fell, and broke LOD. Should I feel happy, should I feel stupid, or should I feel smart that i did not allow market players to take my SL? Planned to trail pivots at 1SD with Target 3SD, changing SAR to SL. 11:57☄ SAR'ed to long, because it looked like a BOF of 7800, though Spot 7800 was still above it. SL at LOD. 12:17☄ Volume appearing again when approaching Spot 7800. Not much volume today around Futures 7800. So, is Spot more relevant than Future today? 13:15☄ Congestion just above Spot 7800, at 1SD. So, placed SAR below it. 13:18☄ SAR hit. Now short. Dirty congestion above. Price may want to come back there. 13:22☄ Spot 7800 cracks, and... free fall. No, BOF... WHAT THE. Put a SAR above 1SD pivot.